It is one of the most famous regions of Portugal. Whether for the gastronomy, the wines, the sympathy of its people or the immense landscape, monumental and cultural heritage. From the historical center of Évora (UNESCO World Heritage), to the streets of Beja and the immense Alqueva lake. From the castle of Marvão on the border with Spain to the beaches and cliffs of the Southwest Alentejo and Costa Vicentina there is much to see, do and live in the Alentejo. A region that attracts more and more foreign investment also on account of the area of mount, olive groves and vineyards. Acquiring a farm or a vineyard in this region is a safe investment. If you are looking for a farm, know that you have chosen the ideal region. As simple as that: The Alentejo is unique in Europe! 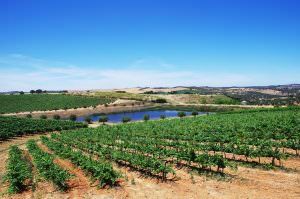 There are definitely no areas or regions in Europe (or even in the world) which are able to compare to the Alentejo region. If you are considering to buy a property in Alentejo, your life will definitely change forever. You will not live in Alentejo it will be the region which will take you over imposing you a slower rhythm and in general a complete different lifestyle… Alentejo is a lifestyle and certainly not a region for everybody – Or you will love it or you will hate it forever. The always shining and extremely hot sun and the incredible huge golden plains – These are probably the words which would be used by most of the visitors of the interior of Alentejo. The large golden wheat fields, the open landscape with some olive trees and cork-oaks and occasionally an old house or ruin which the people in the area use to call “Monte” is the typical scenario of the interior imposing a slow rhythm of life to the people living in this region of Portugal. The interior of the Alentejo is rich of history and you will find historical and even classified heritage sites spread all over the region. Marvao, Monsaraz, Evora and Arraiolos are just a few samples for the very interesting and diversified historical and touristy offer in Alentejo. Alentejo gastronomy is one of the most appreciated in Portugal. 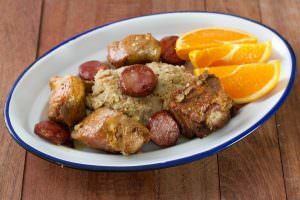 At the base of its rich and diverse recipe are simple ingredients such as bread, from which you make crumbs, stews and “açorda”, meats and sausages and fish the fresh ones on the coast and the resistant ones like the “cação” and cod in the interior. And then there are the wonderful wines and olive oils, and the sweets… oh the sweets…! The beaches of the Alentejo coast are for all tastes: There are the wild ones, the ones with world-class waves, the ones with small natural pools, ideas to entertain the little ones and there are river beaches like Monsaraz or Mina de São Domingos. Most of its beautiful coastline is still undeveloped maintaining its breathtaking completely natural and pure vegetation which seems untouched by the human being. Nevertheless you will find along the “Blue Coast” also very typical touristy and highly developed places like the Troia peninsula, Sines, Porto Covo and Vila Nova de Milfontes just to mention a few samples. All along the “Costa Alentejana” you will also find a wide range of activities related with the ocean which includes surfing, windsurf, sailing, motor-boat cruising, kayaking, water-ski, scuba diving and so much more colorful pastimes…there is no way to get bored! The Blue Coast are hundreds or even thousands of hectares of natural habitat declared as “natural reserve” which include the cliffs in Cabo Espichel, the Serra da Arrabida natural reserve and mostly of the coastline overlooking the Atlantic Ocean. 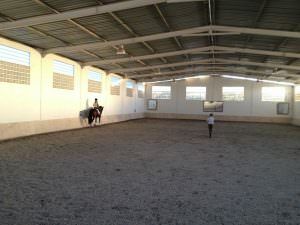 The perfect farm in Portugal for horse lovers combined with tourist guest accommodation. Beautiful and exclusive farm for sale in Alentejo close to Arraiolos, Estremoz and Evora.